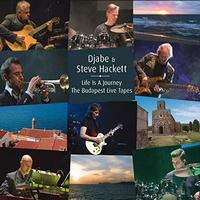 When Life Is a Journey, the studio album released by Djabe and Steve Hackett came out recently, it made my best of the year list. So, I was anxious to hear this live set. Well, I was not disappointed. We get a double CD set that also includes a DVD of the main shows. 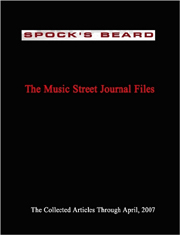 The music is fusion based for the most part with leanings toward both world music and more pure progressive rock. Hackett isn't on the stage the whole show, but most of the time he is. They do Djabe songs, cuts from the album they did together, some solo Hackett music and some Genesis tunes. It's all delivered in style. This is an exceptional bunch of musicians, and it really shows in the quality of the performance. I'm a bass player, so I guess it's no surprise that the guy (other than Hackett) who really stands out for me is bassist Tamás Barabás, The man is so good. Everyone here is to be honest, but I just notice bass players more a lot of the time. A circulating pattern serves as the backdrop as the band take to the stage.. Then a rhythm section groove with some trippy elements takes over from that point. Some funky bass and killer fusion jamming emerges from there to move us forward. While that bass really stands out, the horns and other elements all manage to shine. This is quite a powerful arrangement. As it approaches the three minute mark it drops way down for a piano and bass led section. The funk intensifies as this starts to build out from there. We get more intense fusion jamming with Hackett's guitar weaving some amazing tapestries in the process. It peaks again after the four and a half minute mark. The bass solos with some smoking hot jamming. Atmospheric textures emerge over the top as this continues. Eventually it makes its way back to a full fusion treatment as the journey follows through. That doesn't last long, though, as they drop back to let the drums shine for a time. Another return to the main fusion structures is made, and the piano playing creates some intricate soloing over the top. The jamming continues driving until after the ten minute mark. It drops down to some weirdness from there to take it to the closing and some well deserved applause. Acoustic guitar textures bring this into being. There is a definite psychedelic meets prog rock element to this introductory movement. After the one minute mark different movements and progressions take over as the music continues to explore. Fast paced bass playing leads this number out of the gate. It's quite funky and so cool. Guitar joins after the one minute mark as the track starts to grow upward. There is some killer jamming that ensues at that point. Both the guitar and bass playing are truly inspired and impressive. It's quite an intriguing and dynamic instrumental exploration. Mellow atmospheric textures with some tasteful piano is on the menu here. There are space music elements in the mix, but this feels very jazzy. After the minute and a half mark the rhythm section and other instruments join, and we're off into some killer fusion jamming. It drops back down to a mellower, retro jazz styled movement based around the piano soloing again further down the road, but then fires back out into a powerhouse fast moving jam from there. It gets into some pretty crazed and freeform jazz territory as it continues. More melodic fusion returns beyond that and lands closer to mainstream prog rock at times as it evolves. Here they turn in a smoking hot rendition of a classic Genesis cut. It's fast paced and definitely has a different flavor. Hackett gets some seriously screaming sounds and this thing is pretty crazed at times. The main familiar melodies, though, work so well. Around the three minute mark there is particularly odd Rock In Opposition styled climax. Then it drops down and Hackett's guitar rises up with familiar lines of music. The rest of the group join in something that's much closer to the original version of this. The horn brings a bit of a different flavor while still respecting the original. They work out to the classic Genesis groove from there with style. It's like speaking it with a jazz accent. It's instantly recognizable, but also flavored a bit differently. The line delivered at the beginning almost sounds like Peter Gabriel. From there they launch into a killer rocking rendition of another old school Genesis piece. They bring some jazzier elements into later, but this preserves a lot of the original sound, too. Coming out of the previous number, this Hackett solo piece gets a killer treatment. It works through all kinds of different shifts and changes along the road. Another Genesis classic, this is a powerhouse cut that showcases so much of the original sound while also bringing some new flavors to it. I love the world music textures that open this. It really feels like you are heading out on some exotic journey as this track works forward. There are vocals on this cut, and the world music grooves as classy. I love the rocking instrumental section that enters later, and particularly the guitar soloing within it. That said, the horn brings something special to the table, too. This is one of the most mainstream prog things here in some ways. Around the four minute mark the percussion takes prominence bringing us into some psychedelic territory. It gets incredibly powerful and jazz oriented on the final build up before the crescendo. Classy fusion brings this into being with a great melodic texture. Hackett's guitar comes to the fore around the two minute mark, painting exotic sonic pictures as it does. Keyboards take command a bit later. The powerful jazz meets prog stylings later have a great groove and killer melodies. A shift around the seven and a half minute mark gives us a mellower, more reflective journey. Guitar weaves slower patterns over the top at times while the bass also shines. This continues to evolve as the journey winds its way through. I love the bass work on the fast paced opening here. This has some killer jazz fusion at its core. Hackett's guitar joins and seriously shreds. The whole arrangement gets set on fire with intensity and power as it drives onward. The jam that takes over by around the five minute mark is among the strongest musical passages of the whole performance. It just keeps moving onward and upward before finally stopping on a peak. The title track from the previous album I reviewed from this act, they deliver a faithful and quite potent live rendition here. This is one of the few songs in this show that have vocals. There are some powerhouse guitar travels around the halfway mark on this track. The tune explodes into more rocking stuff from there, showing off more of the progressive rock angle. Here we have another melodic fusion piece. While guitar is well deserving of note here, the bass playing clearly stands out, as well. More energized fusion is on the agenda here. This works through some varying themes and tones and has some great melodies built into it. There is a drop back to the bass that is so good. The guitar screams upward after that, delivering some killer fretwork. The cut gets so intense as it keeps marching onward. Everybody really gets to strut their stuff as this keeps going from strength to strength. Coming in with classy world music textures, this is much mellower at the start than the previous track was. It is no less dramatic, though. It takes on more of a rocking groove after the minute and a half mark. Some killer world music textures serve as the inspiration for the jamming that ensues. This develops into an amazing powerhouse jam. Here we get another killer fast paced fusion jam. It has a good balance between dropped down and powered up stuff. Around the three minute mark they drop it back to a full on jazz jam. I dig the keyboard jamming that comes in as that winds through. The guitar comes in with full blues jamming. From there it makes its way back to more of a fiery jazz treatment.